All relevant departments of BBA(H) courses are engaged in this process. The purpose of this document is to transfer of a student which was a student of another institute and have passed some of the courses. The credit hours are transferred in this university if they meet the criteria i.e. minimum grade is c+ and course outline is matched. · This process starts from admission office. · A student who was from another institute took admission in our institute and he/she has passed some of his/her courses. 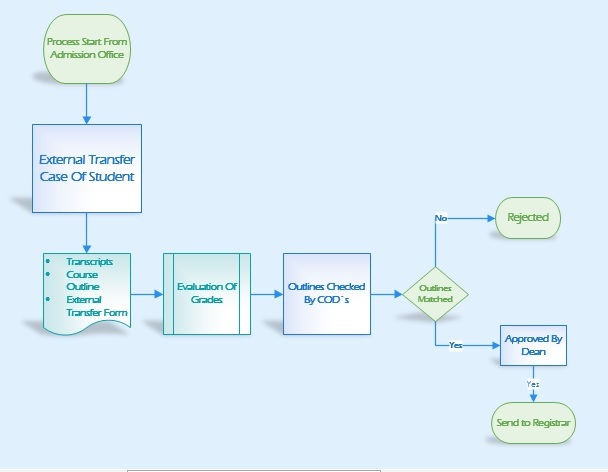 · We require from them their transcripts, course outlines and external transfer forms. · We evaluate their grades if they have minimum c+ grades we attach these three documents and send it to relevant department COD`s. · They evaluate their course outline whether it relates to our course outline or not. · If course outline contents are not matched it is rejected. · If course contents are matched to some extent it is approved by COD and send it to Dean`s approval. · After dean`s approval we send this document to registrar for their processing.